You have to smile as you settle into the outdoor lounge chair from the inside of your Eclipse E-Zip awning with the bug screen because with it, you have solved the age-old problem of enjoying the great outdoors in the country without blaring sun and annoying bugs. You grew up in this house on the edge of the woods and have countless happy memories of family days and summer gatherings with your Mom calling you and telling you to make sure and not get sunburned, to sit under the awning for a while and cool off, and on and on as mom’s are prone to do. You can almost hear her as you sit on the same porch now, lying back with your eyes closed. Outdoor solar shades with the insect screen will keep you from being bothered by annoying bugs and protect you from the damage of the sun’s UV rays. You’ll have reduced sun glare indoors and use your air conditioning less often which means your energy bills will be lower. 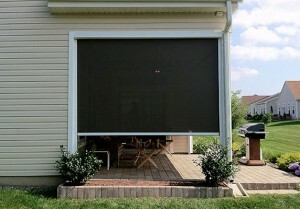 The Eclipse E-Zip Side Retention Solar and Insect Screen includes a bottom track seal and has a custom designed motorized system with the option of each screen operating separately or all at once. A few years ago when your folks moved closer to the city and the amenities they want to have as they grow older, you moved to the lake house and have enjoyed every minute of it. The lake is only a short walk away and the grandkids will be here this weekend and so will the folks! Everyone will have a wonderful time, with the solar and bug protection of your E-Zip Side Retention Solar and Insect Screen system.